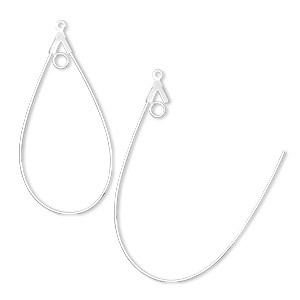 How do I use the ''beading drop'' hoop earrings? I can't figure it out. String beads onto the hoop, close it back up and crimp the crimp at the top to keep the beads in place. You can then use the inside loop to hang a dangle for added embellishment. You can also bead around the outside of the hoops, using wire or thread. To use wire, string on one bead then go around the wire of the hoop making a full round, then add another bead and repeat. You can also use thread and do a brick stitch edging around the outside of the hoop.